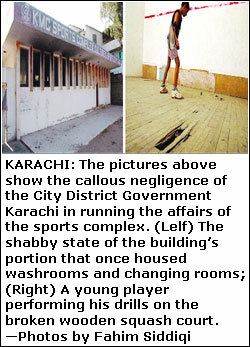 KARACHI, March 6: It takes years to create a proper sports facility but very little time to destroy it. There are a number of such neglected institutions in the metropolis, home of over 15 million people, which can serve as eye-opener for the concerned authorities, the City District Government Karachi (CDGK) sports complex at Kashmir Road being no exception. A recent survey conducted by Dawn shows that the once sprawling sports complex, which provides assortment of sporting facilities and an easy access to middle and lower middle class youth, has virtually gone to dogs. The Kashmir Road project was the brain-child of Zakir Ali Khan, a former chief engineer of the defunct KMC, and served as an active sports centre in the past with tennis as its hallmark. KMC had also instituted annual national ranking Mayor Cup tennis tournament which has produced many talented players. Instead of upgrading the facility over the years, the CDGK Community Development department has, in fact, shown gross negligence towards it and the horrible picture of sports infrastructure nullify their tall claims about the complex. The department is headed by Ms Rehana Saif who succeeded Saifur Rehman Grami upon his retirement. The state of the complex is all the more amazing since there appears to be no paucity of funds for maintenance and renovation since the sports complex earns millions of rupees annually through memberships besides getting rented out for marriages. (New membership is granted for Rs 6,800). It provides sporting facilities such as swimming, tennis, squash, basketball, table tennis, taekwondo, skating, etc. Recently, the tennis courts drew severe criticism from country’s top players who either lost balance or fell repeatedly during a national ranking tournament in January, resulting in shifting of the Davis Cup trials from Karachi to Islamabad. The courts are not floodlit and the organisers are compelled to wind up matches before sunset. In addition to the five courts, the oval-shaped tennis court is also in shambles. A unique facility of its kind in the country, it has a capacity of 5000 people and has served as a venue for international matches in the past. An international boxing event was also staged here once by erecting a ring on the court. One of the most harrowing sights at the venue are the two broken wooden squash courts which, despite a battalion of staffers to look after it, is in perilous state. The premises adjacent to the squash courts that once housed the changing rooms section with showers and toilet is unrecognisably damaged due to the negligence while it has been learnt that motor and pipes were stolen long ago and the place was converted into a den by heroin addicts. The absence of a proper toilet facility has posed huge problems to the members, players and spectators with most of them forced to utilise washrooms at the nearby mosque. However, female members are the worst suffers in this situation because they donot have a choice but to refrain from participation in sports activities altogether.